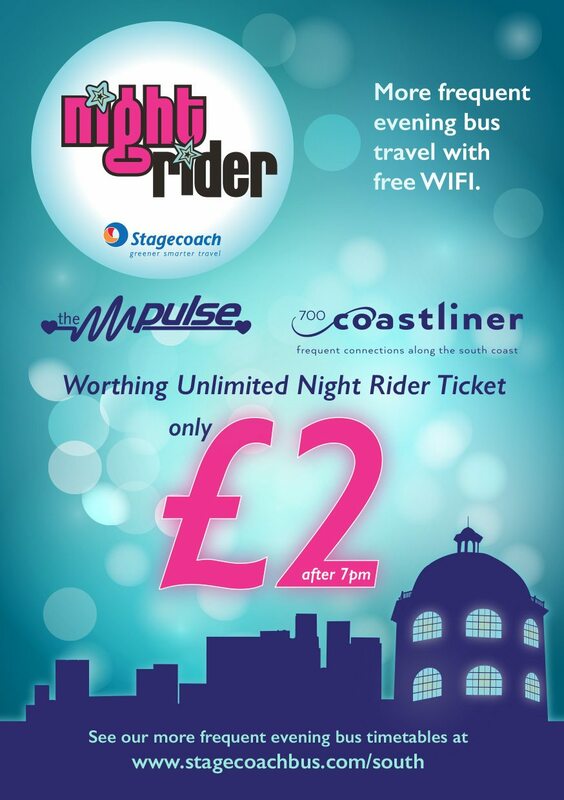 Stagecoach South asked us to promote the £2 nightrider unlimited travel in Worthing and Brighton. The project included Bus livery design, branding, marketing, PR and two event launches in Worthing and Brighton. We carefully created the bus livery design to emphasise the £2 unlimited evening travel deal. We chose a twilight theme with silhouettes of Worthing and Brighton in the background. 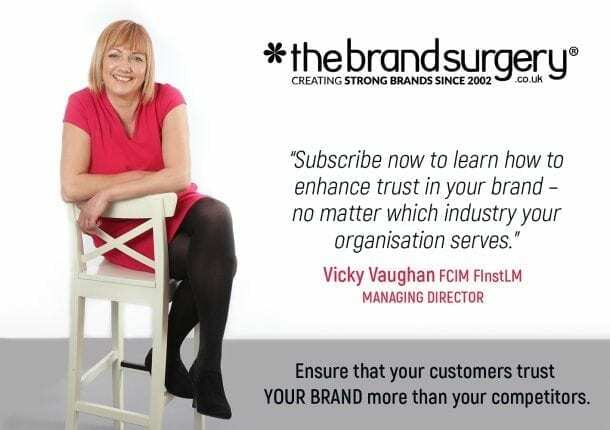 Once the bus livery branding and design was approved, we migrated the theme across to press advertising, leaflet design, postcard design, banner design and promotional products. We then organised the launch events; one in Worthing and one in Brighton which were both well attended. We were delighted that the Mayor of Worthing, Chairman of Adur and Mayor of Brighton and Hove also attended as well as a selection of councilors from all councils across the Coastliner route where the nightrider ticket was available. 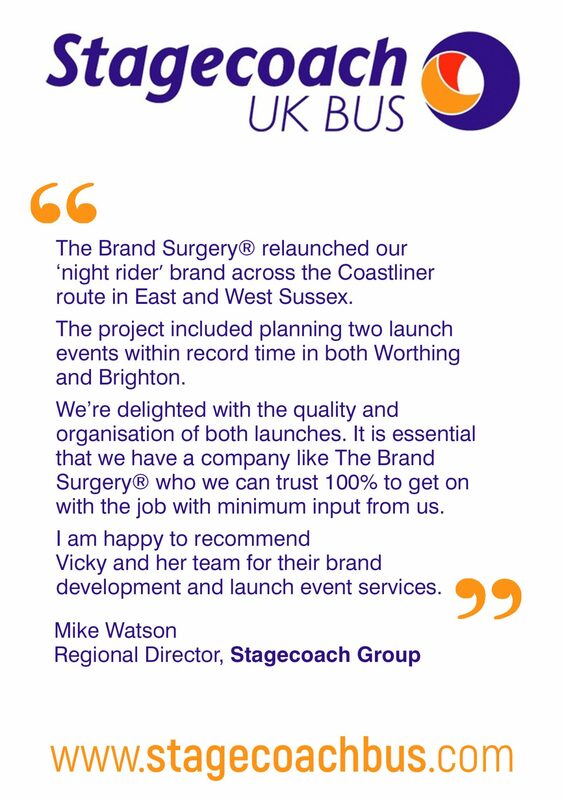 Stagecoach South launched its nightrider ticket and celebrated the increased frequency of its evening services on the Coastliner route in Brighton and Worthing. The nightrider ticket costs just £2 and can be used after 7pm throughout the evening across the South Coast. 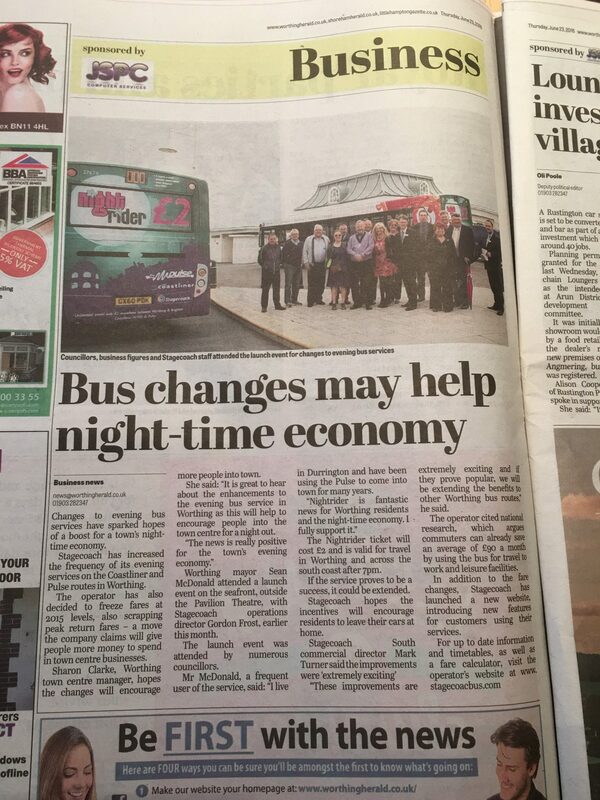 This is excellent news for the local economy and customers alike, who can enjoy reliable travel at a great price, leaving them more money to spend on a night out in Brighton and Worthing. The official launch of Stagecoach South’s nightrider took place on 20 July at the Royal Pavilion in Brighton, where Michael Watson, Regional Director, met The Mayor of Worthing, The Mayor of Brighton and Hove and the Chairman of Adur and many councillors, community groups and businesses along the Coastliner route. The Mayor of Worthing, Cllr Sean McDonald said: “Nightrider is fantastic ticket for the night time economy, I fully support it. I have been known to use the evening bus services to attend Mayoral events”. Stagecoach also announced that it had frozen fares at 2015 prices and, for the benefit of commuters, has scrapped peak return fares which means it is now even cheaper to travel to work. Stagecoach hopes that these incentives will encourage people to leave the car at home. Recent national research revealed that commuters can already save an average of £90 a month by using the bus to travel to work and play! It is also much easier to plan your journey now because the new website, www.stagecoachbus.com, can tell you when the next bus is leaving from your chosen bus stop and gives you the fare for your journey.